Alkmaar, which dates to at least the 10th century, is notable for its key role in the Dutch War of Independence, for the Grote of Sint-Laurenskerk, for being the birthplace of cartographer Joan Blaeu2, and for its Beatles Museum (John Lennon's first guitar was made in Alkmaar). Dutch cheese markets entry: "Dutch cheese farmers traditionally brought their cheeses to the market square in town to sell. 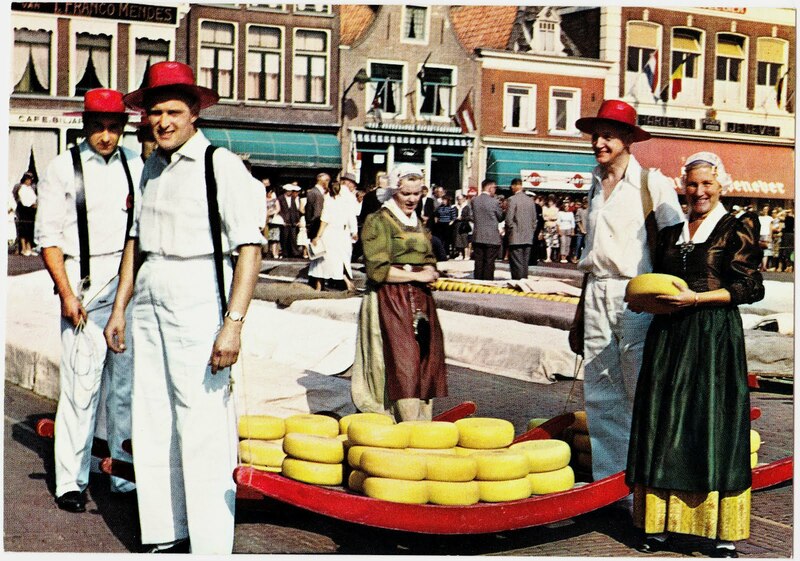 Teams (vemen) of official guild cheese-porters (kaasdragers), identified by differently coloured straw hats associated with their forwarding company, carried the farmers' cheese on stretchers, which typically weighed about 160 kilograms. Buyers then sampled the cheeses and negotiated a price using a ritual system called handjeklap in which buyers and sellers clap each others' hands and shout prices. Once a price is agreed, the porters carry the cheese to the weighing house (Waag), and scale of their company." Interestingly, Trimboli is also tangentally (not as a suspect) connected to the unsolved case of an unidentified female who was found dead on November 29, 1970, in Isdalen, Norway (outside of Bergen). On October 3, 1970, Trimboli and the woman had spent the night together at a hotel in Oppdal, Norway, according to The Doe Network. It has been speculated that she was a spy, perhaps for the Soviet Union. 2. One of Joan Blaeu's maps was featured in the Papergreat post "Maps, maps and more maps." 3. The Waag in Amsterdam was featured in this July 2011 Papergreat post.